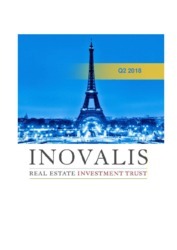 Building on the strong fundamentals of the German and French markets, Inovalis REIT’s operational and financial performance have remained solid throughout Q3 2018. While delivering consistent returns to unitholders, management has been planning for continued organic growth of its portfolio by the end of the year. Inovalis REIT has marked its fifth year as a publicly traded REIT by continuing to demonstrate its real estate knowledge in France and Germany, and building its credibility in the Canadian capital markets. The REIT is delivering solid, consistent returns to unitholders, while simultaneously forging joint ventures to further enlarge its asset base and improve its risk diversification. We are pleased to present the results of the REIT for Q1, 2018. 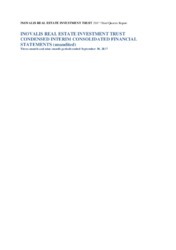 The REIT has had a strong start to the year evidenced by a new acquisition, the refinancing of an existing asset on more favorable terms and, subsequent to quarter end, the completion of a successful private placement. Our Q1 results were ahead of REIT-issued guidance and I am pleased to report that the REIT’s FFO per unit and AFFO per unit, were $0.24 and $0.26 respectively for the 3-month period ended March 31, 2018. 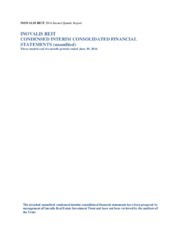 Through a series of strategic transactions, including the successful negotiation of a $10.8 m convertible promissory note, the refinancing of our Baldi and Jeuneurs properties at a rate of 2%, both of which were done in October, as well as the disposition of our 49% interest in the Cologne as part of our capital recycling initiative, at a 5% cap rate at the end of December, we were able to redeploy the net proceeds from these operations into the acquisition of both Neu-Isenberg and Kosching in February 2018 which are both generating returns in excess of 8% resulting in an additional net cash flow of more than $2 m for the REIT. 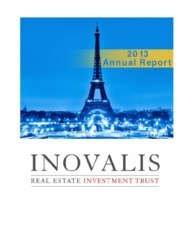 Four years after becoming a publicly traded REIT, Inovalis REIT has managed to demonstrate the breadth of its real estate knowledge in France and Germany, two major markets in continental Europe, and has built its credibility in the Canadian capital markets by delivering solid returns to unitholders, while simultaneously forging joint ventures to further enlarge its asset base and improve its risk diversification. 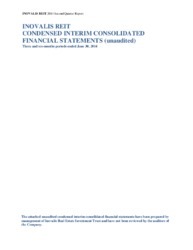 The attached unaudited condensed interim consolidated financial statements have been prepared by management of Inovalis Real Estate Investment Trust and have not been reviewed by the auditors of the Trust. This second quarter was marked by the successful closing of a $13.7 million (€9.1 million) private placement. Proceeds from this placement have been ear-marked for investment in committed acquisitions and they will be equated as equity for the FFO and AFFO calculation. This transaction underscores our strategic capabilities as they relate to real estate growth and financing acumen. In Q2, we completed the acquisition of the Stuttgart property and finalized a new, significant, long-term lease on the Hanover property. 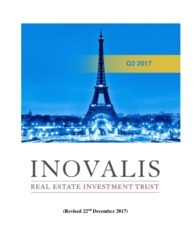 In Q1 2017, the French and German real estate markets continue to demonstrate strong fundamentals, with a combined growth in CPI index and occupancy level. After four consecutive quarters of increases, our leasing momentum resulted in 96.2% occupancy. We are pleased to present our third quarterly report for 2016. With a recent successful equity offering, promising opportunities for growth in our target markets and a dedicated team with local roots, we are looking forward to materializing our future prospects. We are pleased to present our second quarterly report for 2016. With a solid financial position, a recent successful equity raising, promising opportunities for growth in our target markets and a dedicated team with local roots, we are looking forward to materializing our future prospects. We are pleased to present our first quarterly report for 2016 with 18.1% year-over-year growth in IFRS book equity per unit as well as solid FFO and AFFO figures. 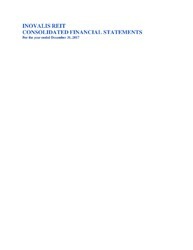 we are proud to present our report for 2015 with 17.8% year-over-year growth in IFRS book equity per unit as well as solid FFO and AFFO figures. INOVALIS REIT 2015 fourth quarter. The attached unaudited condensed interim consolidated financial statements have been prepared by management of Inovalis REIT and have not been reviewed by the auditors of the Company. We are proud to announce our 2015 third quarter results with solid funds from operations (“FFO”) and improved adjusted funds from operations (“AFFO”), reaching respectively $3.9 million and $4.3 million for the 3-month period ended September 30, 2015 and $11.3 million and $12.7 million for the 9-month period ended September 30, 2015. 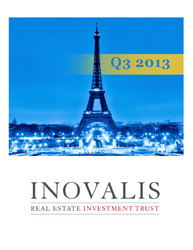 INOVALIS REIT 2015 third quarter. The attached unaudited condensed interim consolidated financial statements have been prepared by management of Inovalis REIT and have not been reviewed by the auditors of the Company. INOVALIS REIT 2015 second quarter. The attached unaudited condensed interim consolidated financial statements have been prepared by management of Inovalis REIT and have not been reviewed by the auditors of the Company. 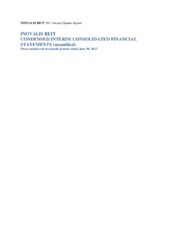 We are proud to announce our 2015 second quarter results with solid funds from operations (“FFO”) and improved adjusted funds from operations (“AFFO”), reaching respectively $3.7 million and $4.7 million for the 3-month period and $7.4 million and $8.4 million for the 6-month period ended June 30, 2015. INOVALIS REIT 2015 First Quarter. Reports The attached unaudited condensed interim consolidated financial statements have been prepared by management of Inovalis Real Estate Investment Trust and have not been reviewed by the auditors of the Company. We are proud to announce our 2015 first quarter results show funds from operations (“FFO”) and adjusted funds from operations reaching respectively $3.7 million and $3.7 million for the 3-month period ended March 31, 2015. 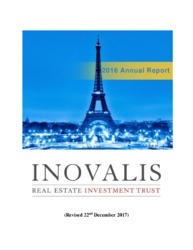 When we established Inovalis REIT in 2013, our objective was to bring genuine European real estate knowledge to the Canadian public equity market. 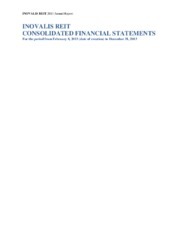 Our 2014 annual report shows a solid second fiscal year and speaks of the relevance of our strategy. 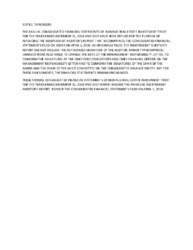 For the period from January 1, 2014 to December 31, 2014. INOVALIS REIT 2014 Third Quarter. Report The attached unaudited condensed interim consolidated financial statements have been prepared by management of Inovalis Real Estate Investment Trust and have not been reviewed by the auditors of the Company. 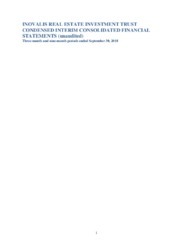 We are Proud to announce Our 2014 third quarter results show funds from operations (“FFO”) and adjusted funds from operations (“AFFO”) reaching respectively $2.6 million and $2.8 million for the 3-month period and $8.3 million and $8.9 million for the 9-month period ended September 30, 2014. 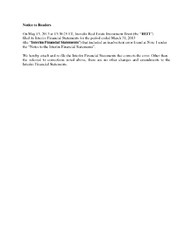 We are proud to announce our 2014 second quarter results with solid funds from operations (“FFO”) and adjusted funds from operations (“AFFO”), reaching respectively $2.8 million and $3.0 million for the 3-month period and $5.7 million and $6.0 million for the 6-month period ended June 30, 2014. 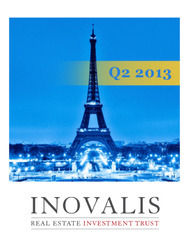 We are very pleased to present our first quarterly report for 2014 with further improved FFO and AFFO results. With a strong financial position, promising opportunities for growth in our target markets and a dedicated team with local roots, we are excited about our future prospects. 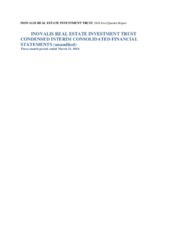 We are very pleased to present our first Annual Report. When we established Inovalis REIT in April 2013, our objective was to bring genuine European real estate knowledge to the Canadian public equity market. Our first fiscal year shows how performing this strategy can be. ------------------------------------------------- On May 15, 2013 at 13:38:28 ET, Inovalis Real Estate Investment Trust (the “REIT”) filed its Interim Financial Statements for the period ended March 31, 2013 (the “Interim Financial Statements”) that included an inadvertent error found at Note 1 under the “Notes to the Interim Financial Statements”.